Show how teachers can promote the values of community, justice, and equality while building academic skills. Published by Rethinking Schools. Rethinking Our Classrooms, Volume 2 is an essential book for every educator who seeks to pair concerns for social justice with students’ academic achievement. 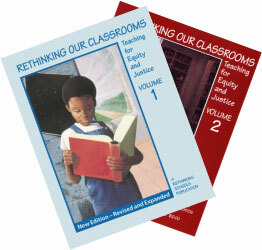 ISBN: 9780942961270 | Published by Rethinking Schools | Order the two volume set. Teaching Guide. By Wayne Au, Bill Bigelow and Stan Karp. 2007. Shows how teachers can promote the values of community, justice, and equality while building academic skills. Published by Rethinking Schools.